These boots are sold in US men’s sizes, so you can choose the size you normally wear in street shoes/boots. The length of the boots seems true to size. And the width feels like a standard width (“D” width) boot. The side buckles have a wide range of adjustability for both the instep and the calf, so in those areas, they should work for just about anybody. I ordered in a pair of the brown color in this new Belize Drystar boot and I really like the look and feel. Most European brand boots are made of various mixes of synthetic materials which is fine, but it is nice to see a boot that has a part-leather upper! In putting on these boots you really get a sense for how secure and sturdy they are. The bulk and stiffness are close to the feel of an off-road boot, but the footbed and foot area reminds me of a heavy duty street boot… one that is built for protection but also walking comfort. I’m not sure I’d want to stroll the mall in these boots, but they really are more comfortable feeling than others like this I’ve tried. It also helps that the tops are a bit lower than most “adventure” style boots like this. Since they are below the large part of the calf, there aren’t the fit issues that taller boots present. I also notice the buckle system on these boots is improved from previous designs. The overall function is not much different from others, but the two buckle pieces engage each other just perfectly and are really easy to use with just one hand. The only trouble I had with the try on is that the Velcro on the flap up near the neck of the boot attacked my sock when putting them on. But I can cure that by getting in the habit of holding that flap back while I slip them on. The soles of this boot are HEAVY DUTY. 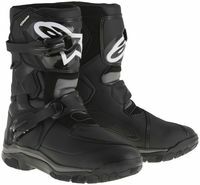 They are plenty stiff and thick enough for adventure riding and they feel like they’ll wear a long long time. In trying to “fold them up” with my hand, I really can’t budge them much at all which is really what you want in a boot like this. Also, this boot has plenty of molded plastic protector pants. The shin and the outside ankle protector reminds me of a road race boot. The inside of the ankle is covered with an internal protector, but the material all up and down the shaft of the boot is super heavy duty feeling. And the toe and heel boxes are heavily reinforced as well.